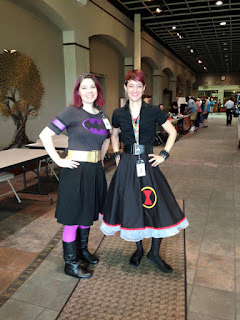 And check out Valerie's post about LibraryCon! 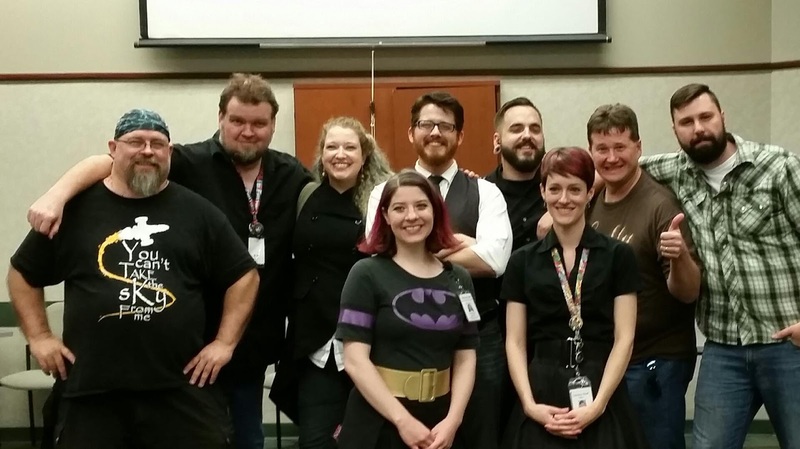 Many cool people who helped make LibraryCon awesome! 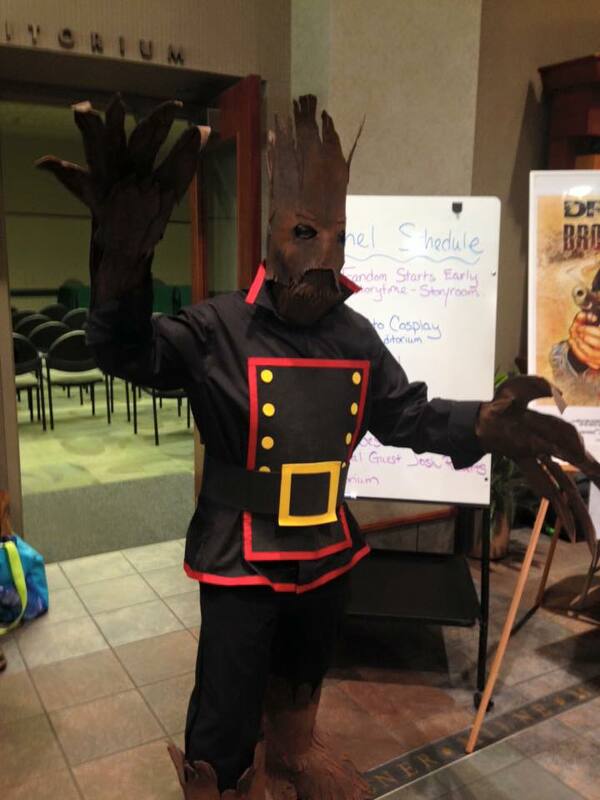 So there were many, many things that went wonderfully at LibraryCon and we pulled off an amazingly fantastic event. I'm so proud of all the work that everyone did and what a fun program it turned out to be. -Involve the local geek community. We reached out to so many organizations, cosplay groups, gaming groups, authors, illustrators, and other area cons to create our booths. In turn, those groups gave us names of others to include. This worked well because it helped us find people who really wanted to be part of this event. -Provide water! And food if possible. We provided lots (over 100!) bottles of water for the people staffing tables and speaking on panels. They told us over and over again how thankful they were for this and it was such an easy thing to do! We also got a donation for lunch for our panelists and provided snacks for those staffing the booths, which was another nice treat. We also made sure we had staff available to sit at their booths while they took a break to eat. -Have something for all ages. 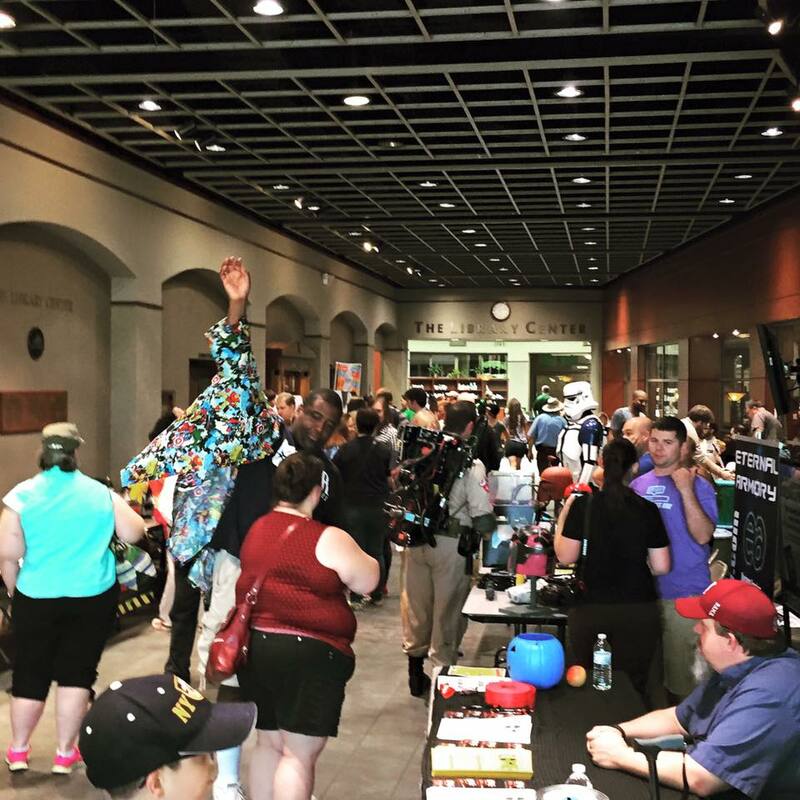 We had a huge mix of ages from kids to adults and lots of families attend LibraryCon because we really wanted it to be a family friendly event. Our booths all had something fun to offer for all ages and having various Cosplay groups was a huge treat for the kids. We also had a Geeky Storytime, which was a huge hit with kids and parents. We could have added even more kid events and plan to do so for next year. -Have assigned tables clearly marked for vendors. Also be sure to have lots of extension cords and power strips on hand. We had every table assigned and the list was left with the greeters at the front door. This made set up very easy and run smoothly. -More Signage-We had a whiteboard outside the panel room and had a flier with a schedule of events and room locations. Everything was kept in our main concourse of the library and the rooms are all located right off the concourse, so it was pretty well contained to the front. But people still requested more signage about what was happening where and where rooms were located. -Bring people into the library. Since most of the event happened in the main concourse, there was very little traffic into the library. This was good (it kept noisy things up front) and bad (people didn't explore the library as much as they could have). We had a scavenger hunt happening in the stacks and not many people knew about it because they didn't make it back to the Children's Department. We also had some kids crafts there as well that got ignored after storytime. I would like to find a way to bring people into the library more and show off lots of library resources and geeky book displays next year. Also, bring over a lot of your Science Fiction/Fantasy/Horror/Graphic Novel collections to highlight at your event. We created a last minute geeky kids book display and the books flew off the display! -Have a booth for the library. This might seem like a no brainer, but we didn't think about it. We thought oh, hey, people are coming to the library so they'll find out about what we offer. But that wasn't the case. Next year, I want to have a booth for library card sign ups and have information about upcoming programs. -Create a hashtag. Neither Valerie or I are very active on Twitter, so it didn't occur to either of us to create a hashtag for the event until the day of! This is a great way to collect pictures and feedback from attendees on social media and spread the word about your event. -Make sure you have enough trash cans. Another silly one, but we noticed that by the end of the evening, the trash cans located in the concourse were overflowing! Something else we really hadn't thought about! But for the most part, there wasn't much trash to pick up and the event itself was very clean. -Offer even more things to do! 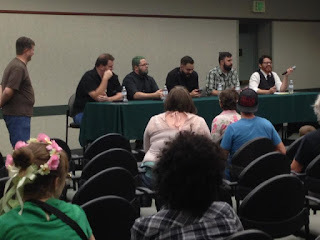 We only hosted three panels because this was our first LibraryCon. We spread them out throughout the afternoon because we were trying to think of when people would arrive, want to take breaks, eat, etc. As my husband pointed out to me, "people will eat when they want to eat-you just have events and let them figure it out." Next year, I think we don't have to worry about spacing things out and having breaks, but instead offer more panels, fandom meetups, and gaming demos. Overall we had a fantastic event it was lots of fun. You don't need to have a huge budget to put on an amazing event. Our entire LibraryCon was put together on about $80, and most of that could have even been taken out and not really needed. Include your community and you will get a great response. I can't wait to do it all again-bigger and better-next year! Since LibraryCon was such a huge event, I've split these posts up into three parts. Find Part One-Planning here and stay tuned for Part Three-What I'd Do Differently! After lots of meetings, prep, and planning, LibraryCon was finally here! On Friday, we set up the concourse and meeting rooms with our tables and labeled everything so everyone could find where they were assigned. I also set up for my Fandom Starts Early Geeky Storytime. We started LibraryCon with a Friday night screening of a local webseries, Drifter. They screened some episodes from Season 1 and then hosted a Q and A with some of the cast and creative team. We had a small but very interested turnout (we had around 30 people attend for this event). We weren't sure if it was the timing, the day, or having two days worth of events, but the people that came loved it. Valerie and I didn't know if we would have a small or big crowd the next day, but we went home excited for our main day of LibraryCon. 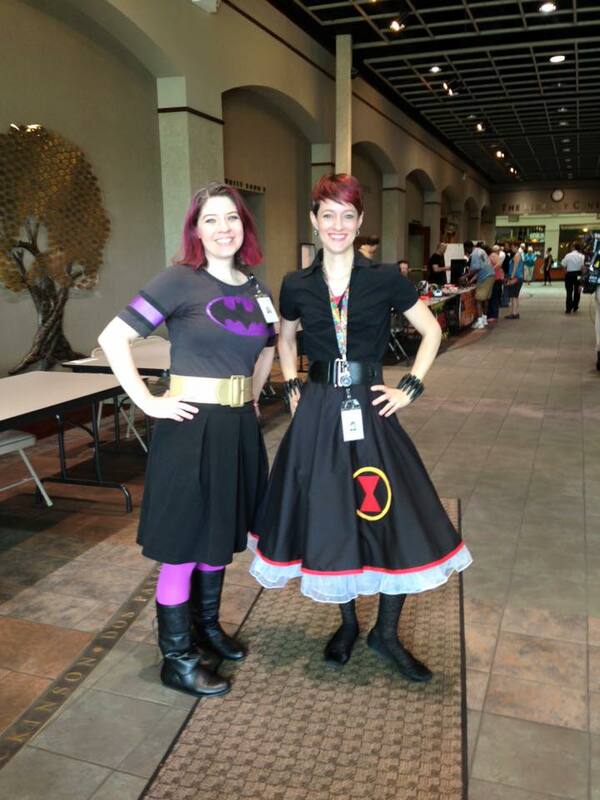 It was finally Saturday, the day of LibraryCon! Our guests and "vendors" started arriving around 9:30 to start setting up. The first event of the day was Fandom Starts Early Geeky Storytime at 11:15. I had done this storytime twice before, but had always had a small crowd and not the geeky families I really wanted to draw in. This was the perfect opportunity to have those fandoms come together in a storytime and I had a great crowd of kids who loved making the TARDIS fly in a parachute, fly like superheroes, and read about Star Wars and Star Trek. We even got told by one of the parents that this storytime was "groovy!" Yay! After storytime, it was time to start the main event. We had all of the guests and vendors set up and people could visit with each table. We had three panels throughout the day and honestly, we could have had even more. We put in a lot of time between each panel and we could have filled that time easily with other events. 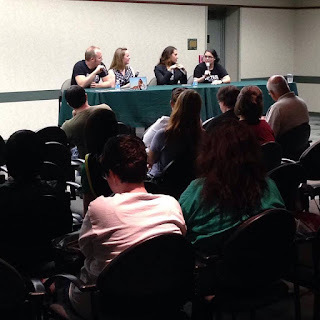 We had a Cosplay Panel, Author Panel, and Illustrator Panel. The highest attendance was for the Cosplay panel. I'm not sure if it was the theme, the fact that it was the first one, or a combination of those things. We still had a good turnout for the other panels, but I think if we had spaced them together more, we would have had more people. The crowd had lots of great questions at each panel and were very excited to have a chance to hear from each group. In between panels, con-goers visited with the various booths and each table got a lot of traffic and promotion. Our authors and illustrators commented several times about how great the event was and how they got to have a chance to talk to the people who came by. People started arriving for the event around 11, just before the storytime started and LibraryCon really started to pick up around noon. Throughout the day we had 400 people attend our event. Most of the time was spent visiting with each table, talking to the people at the booths, and the teens spent a lot of time talking to the authors and illustrators and buying books and drawings! I saw many teens (and adults) leaving the event with bags full of great swag. In addition to the authors and illustrators selling items and many of the booths hosting giveaways or offering something special, we had a library prize board. We put together multiple prize packs and had a large whiteboard with photos of each prize pack, what was included, and a target age range for the prize pack up front at the greeter table. Guests could enter to win one of the prize packs and we called the winners the following week. We had lots of water for all of our panelists and everyone staffing a table, which was greatly appreciated by all. We also had some food donated (thanks Chipotle!) for our special guests. We had staff scheduled as greeters, room attendants and floaters, so there was always library staff available to answer questions, welcome people to the event, and take care of room needs during the panels. We had staff at the door throughout the event to pass out fliers which served as our schedule of events. It got pretty easy to spot who was coming for LibraryCon as the day went on-you could tell who was in costume and who wasn't. 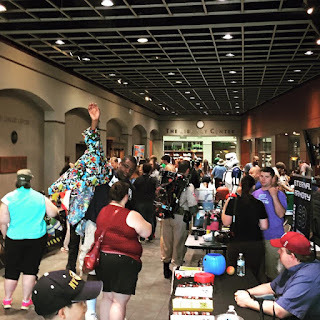 We did have several people who said they didn't know LibraryCon was happening that day but they were so excited they had come to the library and found out about all these great area organizations. 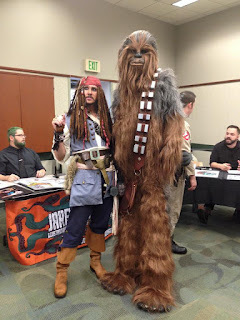 There were still many confused faces from patrons as well who came into the library thinking it was a typical Saturday and discovered Storm Troopers, Deadpool, Ghostbusters, and Captain Jack Sparrow wandering around. Someone even came by and asked "what's the point of all this?" which gave us a wonderful opportunity to explain that the library is a community space and we had organized an event to promote and bring together the fan and pop culture communities in our area. The best thing about our event was that many of the groups and guests knew each other from the area or other events. There was such a positive camaraderie between all the vendors throughout the day and that really carried over to everyone who attended. Even the people staffing the tables kept visiting other booths and tables and talking to each other and hanging out, so it was fun to see the geeky community really come together. The final event of the evening was our documentary showing of The Midwest in Panels. 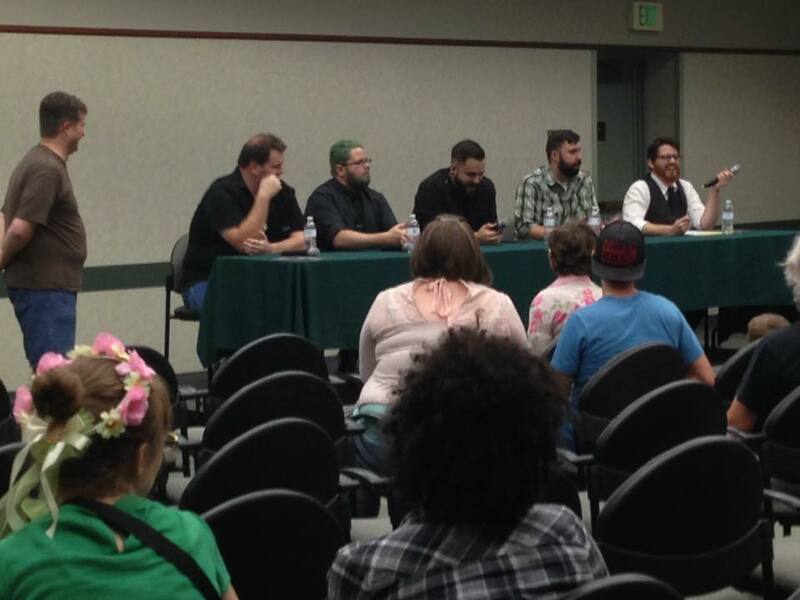 We kicked off the event with a Q and A featuring the owner of our local comic book store. Then we watched the documentary with a small but dedicated crowd who stuck it out for the entire day. While the documentary was showing, our vendors closed up and Valerie and I did a lot of clean up. We ended the event at 8:30 that evening and had about thirty minutes to clean up, put away last minute things, wrap things up before the library closed. It was a long day but it was totally worth it! 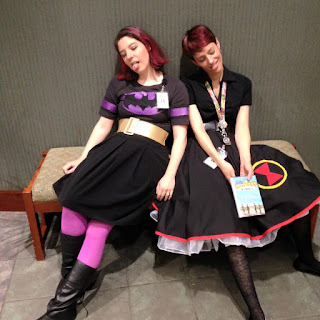 Two tired librarians after a long day of LibraryCon! I've been wanting to host a huge fan convention at the Library for awhile now and I knew it could be done! Many years ago I hosted a Mini-Anime Con for the teens and it was a great event and our Cosplay prom was always huge, so I knew we had an audience ready for an event like this. When I hired Valerie as the Teen Librarian, I knew she would make an excellent LibraryCon partner in crime and so our first annual LibraryCon was born! The planning: Planning for this event started many, many months in advance. We are very lucky that our branch manager is a huge comic fan and fellow geek, so we had great support. The three of us met and had several brainstorming meetings of who to invite and we made a field trip over to our local comic book store to talk to the owner about local artists we should include. Valerie also made a trek to another area con that happens in the winter to scout out some possible guests for our event. We had a date and had every possible space in the Library reserved. We came up with a schedule of events and then we started emailing and contacting people. We decided on three panels and ending the evening with something big, but we weren't sure just what yet. We put out a call to fellow staff and asked them who they knew and could connect us with. Valerie and I pooled together our geeky community connections and set up a list of people we wanted for panels or booths at our event. 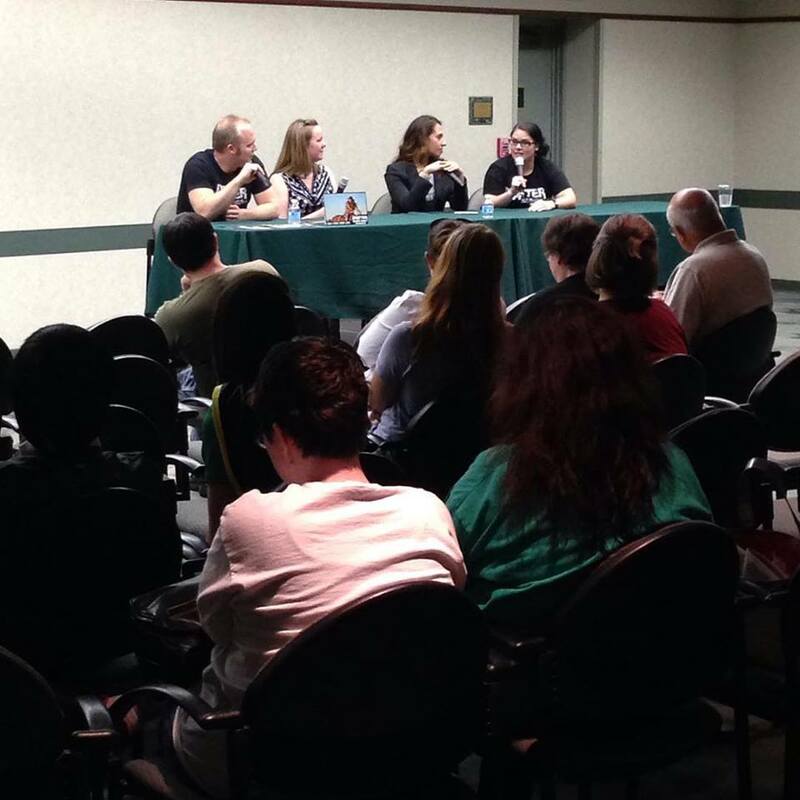 We recruited people for a Cosplay Panel, Author Panel, and Illustrator Panel. Between the two of us, we were able to bring in guests for the panels (and many were friends of ours, so they offered to do the event for free-even better!) It worked out we each had two big events to host/moderate during the day of the Con. We were able to have groups in the community have booths at the event which was a great way to showcase the geeky offerings our area has. 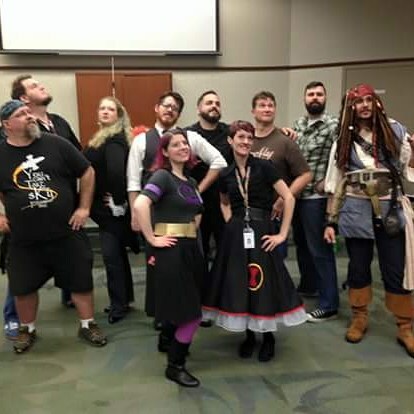 We featured our local comic book store, a couple of local geeky podcasts, two area gaming and fan conventions, a gaming organization, a Ghostbusters group, a LARPing group, a Star Wars group, a local group called Eternal Armory who makes amazing metal and costume pieces, and some local Cosplayers. These groups were all in our main concourse right when people walked in. We made one of the meeting rooms located in the concourse our Author and Illustrator room, which worked out really well. Then word started to spread and people started to contact us which was great. We honestly didn't expect such enthusiasm for our event and we ended up with about 13 tables/booths for groups and organizations in our concourse and around 14 tables for authors and illustrators. Through a friend of mine I met Captain Logan, who had recently filmed a documentary, The Midwest in Panels, about comic book stores in the Midwest-and he was willing to let us screen in at our LibraryCon! Another great connection and win! The documentary is fantastic, by the way, and if you like comics you should check it out! We organized a schedule and the amazing Valerie kept in contact with everyone leading up the event. Seriously, I couldn't have done it without her! I made a list of staff we would need and where and sent out a call for extra staff to help us out the day of LibraryCon. Our Community Relations Department made us some amazing fliers and we took these to the stores that we would be at our event. We also found out at the event that dedicated fans passed out fliers around town for us and helped spread the word. Then, we waited, stayed in contact with our guests, and excitedly promoted our event! So the Meet the Music Hero was pretty much born from this book and Angie's post about doing a program around this book. I had read it and loved it and knew I had to include in this series. Plus, Melba was born and lived in Kansas City as a child, so I loved that there was a local connection to our state! We started this program with going over some background info, talking about jazz and how girls didn't often play jazz. I talked about how picture book biographies are amazing because you can learn about people you never knew about! I told the kids that I hadn't known about Melba until I read this book and I'm glad I learned about her because her story is wonderful. 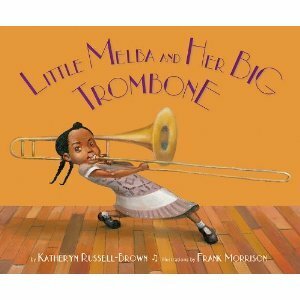 Then we read Little Melba and her Big Trombone by Kathryn Russel-Brown. We also got to make a week to week connection with this book and the previous week because Melba played with Charlie Parker! Then we watched a video of Melba playing her trombone. I loved it when we could show a video of our hero because Pamela and I thought it made it so much more real for the kids. Also, extra points for this video because it features an all girl jazz band! Then we played more of Melba's music and let the kids check out the fun fact wall Pamela made. We had them make "trombones" out of strawbees. They were able to put the straws and connectors together to create whatever instrument they wanted to make, but they loved trying to make the slider on the trombone out of straws! We also put out lots of books on display, especially titles about female musicians. And this is what I get for not posting about this program until weeks later-I know we had another station, but I can't remember what it was! We had a small but dedicated group this week and the parents were very engaged. I think they loved learning about someone they had never heard of as much as the kids did. As we read Melba's story, the parents said "wow!" almost as much as the kids which I thought was wonderful. I loved introducing them to a new musician and new book. For the Meet the Music Hero program that Miss Pamela and I did this summer, I wanted to make sure we highlighted musicians that were known and some that weren't as well known. I also wanted to include a diverse group of musicians. For week two, we chose Tito Puente. 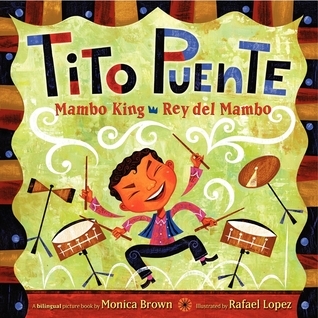 I started with some basic facts about Tito Puente, told the kids about the instruments and music he played, and then read the fantastic picture book biography, Tito Puente Mambo King by Monica Brown. Unlike our previous week's hero Mozart, I could show video clips featuring Tito Puente! He appeared on Sesame Street, so I used those to introduce his music. I had some older kids who rolled their eyes a bit (Sesame Street-that's a baby show!) but the younger kids loved it! I was also able to show a clip of Tito Puente performing live, which the kids loved. I even had them get up and try dancing the mambo along with the video! I then passed out some rhythm sticks and used good old Hap Palmer's Tap Your Sticks to give the kids a chance to try tapping their sticks to a rhythm and become musicians. -Nick Jr has a coloring pack of Hispanic Role Models, including Tito Puente, so we put these out for the younger kids. -Since Tito Puente played lots of instruments, we put out drums and pianos and various things like a box, coffee canisters and rhythm sticks to play with. -I had the kids decorate their own "drumsticks" using crayons and Popsicle sticks and encouraged them to drum on anything they could think of! -Miss Pamela created another awesome "Did You Know" fact wall with fun facts about Tito Puente and his music. This week we had a much smaller turnout (only about 10 kids) but they all really enjoyed it and had lots of fun. They especially loved trying their hand at drumming! So one Sunday afternoon I was working with Miss Pamela and I came across this fantastic blog post from Angie about her Meet the Music program. It got me thinking about programs and since were in the middle of planning for our Summer Reading Program, I immediately thought of a Meet the Music and Art Hero program. I asked Miss Pamela if she wanted to team up-she has more of an art background and I have a music background-and our program was born. We decided to host a program on musicians once a week during the month of June (we dedicated July to artists). I went through picture book biographies and chose titles I thought would be good for storytime or to build a program around. This did limit us a bit, since I was looking for shorter books and I was working with ages 4-8 for the program. But you could adapt this program for any age and use longer books if you wanted. The first week, we kicked things off with Wolfgang Amadeus Mozart. We started the program by giving the kids some background information on Mozart-his full name, date of birth, when he started playing and composing music, what he was famous for, why he's important, etc. 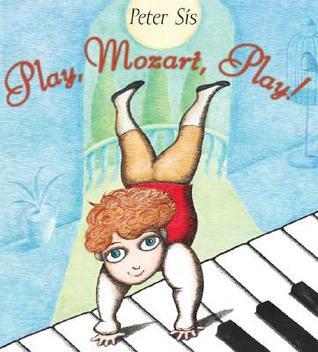 Then Miss Pamela read Play, Mozart, Play! by Peter Sis. 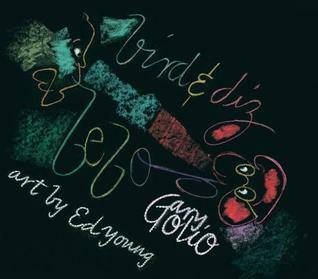 This was a great choice for our young audience and we had them repeat the "play, Mozart, play" refrain along with us. I used some short Mozart pieces from Beethovan's Wig and had the kids shake the parachute along to the music and listen to when it slows, when it's fast, soft or loud. I talked about how Mozart composed classical music and how classical music is often used in movies and TV and how a lot of classical pieces have become famous because of that. I made a short quiz of songs (things like the theme to Masterpiece Theater, songs from Fantasia, William Tell Overture, Ride of the Valkyries, In the Hall of the Mountain King, etc) I had the kids listen and tell me if they had ever heard the songs before and where-the adults had lots of fun with this too! I didn't have a good movement song to go with one of Mozart's songs, so I used Tippy Toe from The Learning Groove as a way to get the kids listening to thinking about classical music. I then talked about how classical music can have a lot of secrets and surprises in it and you really have to listen to it and I had the kids lay down and listen to Haydn's Surprise Symphony, which is one of my favorite classical pieces-and if they don't know they jump in the middle which is always a lot of fun! -Compose your own music-we set out various instruments and let the kids play-this got very loud because we put out a couple small pianos and some play drums! -Mozart wigs-I had some white yarn already cut out for our superhero masks, so I reused the leftovers and had the kids gather the yarn all together to create wigs perfect for a classical composer. -Mozart "Did You Know" fact wall-Pamela is amazing and created a did you know wall with some fun facts about Mozart. We had a huge turnout for this program-27 kids!-which was much more than we were expecting. A lot of our homeschool families loved this program and decided to use it as a history unit, which was a fun idea. And we sneakily educated the adults about classical music and picture book biographies along with the kids, so it was a win-win all around! About the Book: Miles is not excited to be moving to Yawnee Valley-how exciting can a place be when there's a yawn right in the name? Miles was known as the best prankster in his old town, always pulling stunts on his friends. When he discovers that Yawnee Valley already has a prankster, Miles has to figure out who it is-and take the prankster down. Each one tries to one up each other, leading to more epic pranks and jokes in a hilarious prank war. GreenBeanTeenQueen Says: This book is sure to inspire tween pranksters everywhere! 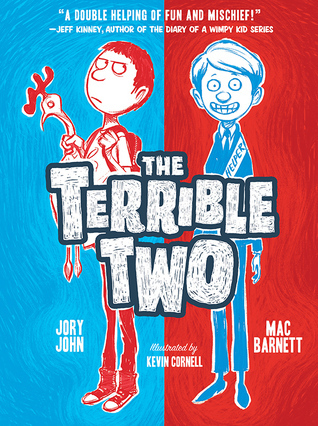 The Terrible Two is the hilarious tale of two epic pranksters had me cracking up. I listened to the audiobook, so while I'm sure the book itself is great (there are illustrations inside making a perfect book to give kids who are enjoying chapter books with illustrations) I loved the audiobook so very much. Adam Verner, the narrator, offers up a variety of voices for the characters and I laughed so much while I was listening-I especially loved his principal voice! The pranks in this book are awesome and hysterical. These boys are not your average chalk in the eraser, whoopie cushion on the chair pranksters. They go above and beyond and their pranks are over the top that I know readers will get a kick of all their planning and pranking. The supporting characters are also very exaggerated, which adds to the humor. The principal comes from a long line of principals and he's a hapless leader. I loved the jokes about his speeches and principal lessons-I think adults would get a kick out of this book too. The Terrible Two was a quick listen and a book I immediately went back to the library and started putting in the hands of my readers. It's perfect for readers who enjoy Jon Scieszka and when kid asks for a funny book, I know exactly what to give them. But make sure you have your readers promise they won't pull any of the pranks they learn on you!